I have been thinking about these categories for many months now. I believe they cover all the variations one can find in New York City today. It is time to end the old way of things. Broadway, off-Broadway, and off-off Broadway designations do not do justice to what is really happening. To many, these classifications represent quality. In reality, they do not. Also, they do not represent where they are geographically. If this were true, the United Palace in Washington Heights would be a Broadway theater. Technically, they signify the number of seats in a theater. off-off is 99 seats and below. Off-Broadway is 100 to 499. Broadway is 500 seats and above. I call for these 4 types of theater to be used when defining the type of theater you are seeing. 1. Destination Theater. Originally, I wanted to name this Tourist Trap Theater. I decided that was too harsh. If this name is to stick it should have something positive about it. (Of course, one could argue “off-off” has a negative connotation but that moniker has stuck for more than five decades so what do I know.) Destination Theater is made with big budgets and has some element most people know already. It has a name involved many people coming to the city would already know or the material is familiar. On the positive side, it brings needed money to the city. 3. Artisanal Theater. Usually vetted outside the city and imported in, this type of theater is pricey. People go to see this because certain publications have given their approval of it. Standing in the lobby at intermission, you can frequently hear patrons say they have no idea what is going on. I don’t know if this is because the patrons usually spend their time thinking about other things or because they have so much money they do not care whether they understand something or not. They know so-and-so from such-and-such said it was good so it must be good. 4. Indie Theater. Made by the artists. Usually for budgets less (often way less) than $30,000. They mostly have runs of under three weeks because of rules in place by Actors’ Equity and because tickets sales will never pay for the production, even if each night is sold out. It is the bedrock of New York City theater. People go to see this because they know one of the artists involved, want to work with one of the artists involved, or have slept with or would like to sleep with one of the artists involved. Or they would like to see one of the artists involved fail. The audiences usually are either overly-friendly or very guarded. 5. Added category. (I don’t know if this should actually count. Therefore, it’s not lumped in with the big four.) Bad theater. There is a lot of bad theater in New York City. There is more theater in New York City and more than its fair share of bad theater. I believe this covers it. There are variations. Sometimes a piece of theater might go under more than one category and, yes, there could be sub-categories. But I think the main factors for categorization are money and approval. The amount of money spent on a production and who approves the work really determine the actual type of theater that is being made. 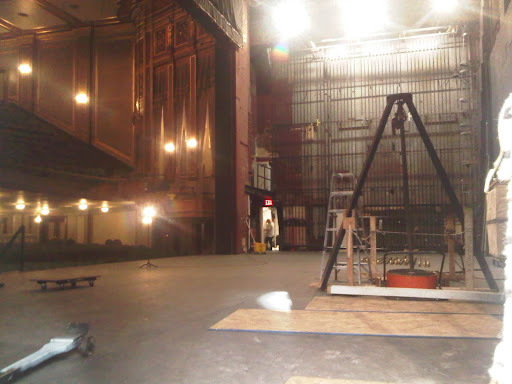 Pictured above, a Destination Theater on 41st Street in New York City getting prepared for a musical, produced by Disney and based on a movie, to begin its run.